We are now a month into Flyod v. City of New York, the federal class action law suit filed against the NYPD that claims they engaged in racial profiling and uncalled for stop and frisks on law-abiding New Yorkers – and the impact that stop and frisk practices have on African-American and Latino communities is more prevalent than ever. Mott Haven’s 40th precinct has one of the highest rates of stop and frisk in the city. This evening, Melissa will be at a Town Hall meeting in the Bronx that she is co-sponsoring, demanding there be an end to discriminatory NYPD practices and calling for a more effective approach to community safety and the passage of the Community Safety Act. It’s time that the NYPD takes accountability for their actions. 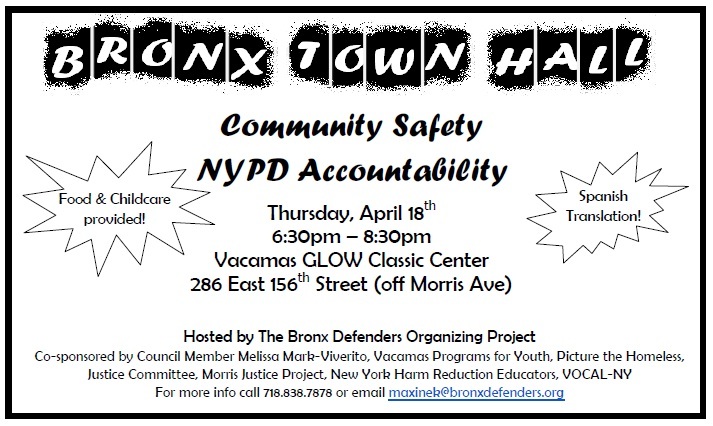 The Bronx Defenders and the Vacamas Programs for Youth will be hosting tonight’s meeting. This entry was posted in Blog, Events, Mott Haven, Take Action! and tagged accountability, Bronx, ChangeTheNYPD, Community Safety Act, discriminatory policing, New York City Police Department, NYPD, oversight, Stop and Frisk. Bookmark the permalink.